The gravitationally lensed galaxy SDP.81, imaged by ALMA. 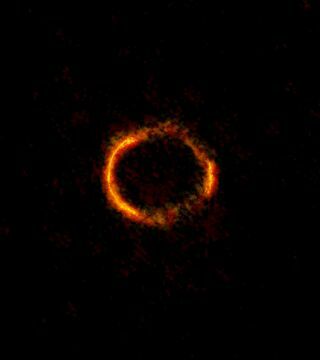 The bright orange central region of the ring reveals the glowing dust in this distant galaxy. The surrounding, lower-resolution portions of the ring trace the millimeter-wavelength light emitted by carbon monoxide. A new image of an extremely distant galaxy looks like it was the inspiration for the "One Ring" in "The Hobbit," but it's actually the result of gravity bending the light into a circle. In the mythical world of Middle Earth, the "One Ring" is an instrument of great power and destruction, forged in the fires of Mordor. In the cosmos, gravity and two perfectly aligned galaxies created this glowing circlet of light. Scientists also created video explaining how the cosmic ring was forged in space. The burning circle of light captured by ALMA is made possible by a second galaxy that lies directly between SDP.81 and Earth. Instead of blocking the light from SDP.81, however, the gravity of this second galaxy bends that light into a loop. This bending of light by a massive object is called gravitational lensing, a phenomenon predicted by Albert Einstein's theories. Einstein showed that space is not rigid, but is instead flexible, like the surface of a trampoline; a massive object can bend space the way a person bends the fabric of a trampoline. In places where space is bent by gravity, light takes a curved path instead of a straight one. An ALMA/Hubble composite image of the gravitationally lensed galaxy SDP.81. The diffuse blue element at the center of the ring is from the intervening lensing galaxy, as seen with the Hubble Space Telescope. Gravitational lensing can warp and smear the light from distant objects, but when two objects are perfectly lined up, it can also create a perfect ring of light called an Einstein ring (which can lead to emoticons in the night sky). The light from the brightest regions of the ring comes from glowing dust clouds in the galaxy, while the fainter red light in the surrounding area is light emitted by carbon monoxide molecules, according to a statement from the National Radio Astronomy Observatory (NRAO), an ALMA partner organization. The image was taken in October 2014, and was released by NRAO on April 7. Gravitational lensing smears the light from SDP.81, but also magnifies it. SDP.81 lies 12 billion light years from Earth, meaning the light astronomers see was emitted 12 billion years ago, when the universe was only 15 percent of its current age. ALMA's highest-resolution image ever reveals the dust glowing inside the distant galaxy SDP.81. The ring structure was created by a gravitational lens that distorted the view of the distant galaxy into a ringlike structure. "Gravitational lensing is used in astronomy to study the very distant, very early universe, because it gives even our best telescopes an impressive boost in power," ALMA Deputy Program Scientist Catherine Vlahakis said in the statement. "With the astounding level of detail in these new ALMA images, astronomers will now be able to reassemble the information contained in the distorted image we see as a ring and produce a reconstruction of the true image of the distant galaxy." Even with the additional boost, the image of the ring of light from galaxy SDP.81 is the highest resolution observation ever taken by ALMA. According to the statement, seeing the ring is the same as seeing "the rim of a basketball hoop atop the Eiffel Tower from the observing deck of the Empire State Building."